Now that the Pecan Brittle from Part 1 of these recipes has been made, time to make the Coffee Cake. Pre-heat the oven to 180°C/350°F/Gas Mark 4. Grease and line 2 x 8″ tins. The basis for this is like that of My Lemon Curd Cupcake recipe, most of the quantities have just been doubled, with coffee and a pinch of salt added. 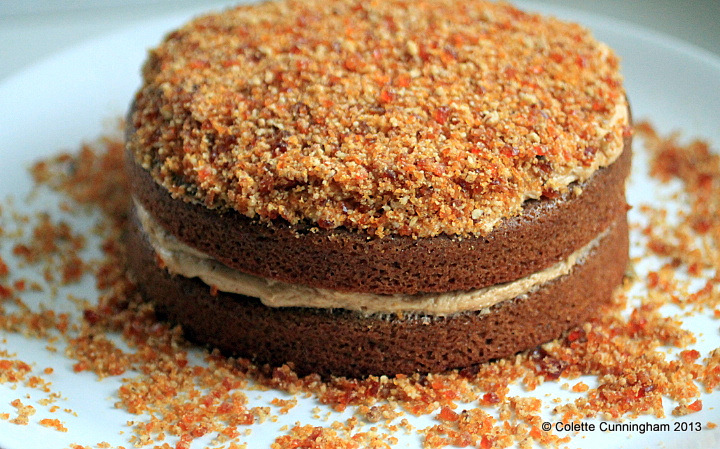 The “usual” method applies to making this cake, i.e. cream the butter and sugar together. In a separate bowl, sift together the flour and baking powder and salt. Add the eggs, one at a time, with a spoonful of flour, and combine, until all the flour is incorporated. Finally, add the vanilla extract and coffee, and beat again. Divide the mixture evenly between the two tins and bake for 35 – 40 minutes. Check it has cooked by inserting a skewer. If it comes out clean, it’s done. 1 tablespoon Coffee Granules mixed with 2 tablespoons boiling water (allow to cool before adding to the butter-cream). Beat the sugar and butter together. Add the coffee and beat once more. Divide the mixture in two, and spread half over one of the cooled cakes. Cover with the other cake and spread the remaining butter-cream over the top. Sprinkle on the Pecan Brittle to decorate. You could use the remaining brittle to mix through some vanilla ice-cream for a quick dessert. Next Post As long as it’s not controversial…..
Oh lord, Colette, and I still have had a chance to read the Pecan brittle recipe! You’re just way too quick for me!!! Love the idea of the brittle. The current husband enjoys coffee cake above all other forms of cake, and pecan brittle would put him over the edge , try it I must! The pecan brittle on top looks amazing. Yum!